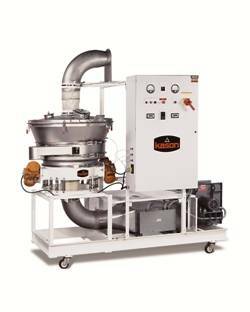 Kason’s Vibro-Bed™ Fluid Bed Agglomerator employs a spraying system that introduces moisture to powdered material as it is fluidised and dried, forming agglomerates on a controlled basis. Equipped with imbalanced weight gyratory motors and mounted on a spring suspension, the fluid bed chamber vibrates as a column of heated air flows upward through a fine-mesh screen, causing particles to separate and become airborne as they are sprayed with liquid. The vibratory motion of the processor also serves to convey the material along a defined pathway across the screen for uniform agglomerating and drying on a "first in/first out" basis, and to evacuate the fluid bed at the end of each cycle. To prevent the fluidised particles from being pulled into the exhaust air stream, the fluid bed exhaust plenum tapers outward to a larger diameter than that of the fluid bed screen surface, reducing air velocity. Inherent rigidity of the circular unit allows materials of construction to be down-gauged and vibratory motors to be down-sized. Reductions in material, weld seams, and associated labour are said to decrease fabrication cost, especially when units are finished to FDA, USDA, BISSC, or 3A standards. Compactness and light weight also allow pre-engineering and configuring of systems on castor-mounted frames complete with blower, heater and controller, requiring only on-site connections to a power source, dust collector, and material inlet/outlet. With reduced weld seams, a quick-disconnect housing, and no internal cross members, the fluid bed processor can be sanitised rapidly. Units are offered in diameters from 460 to 2135 mm, encompassing batch and continuous applications from low-capacity laboratory and pilot plant testing to medium-high volume production. All can also be configured for dedicated powder coating applications as well as fluid bed drying, cooling or moisturising. Other bulk processing equipment manufactured by the company includes round vibratory screeners and centrifugal screeners for sifting, scalping, classifying, de-dusting, de-lumping and dewatering of dry bulk materials and slurries.